How to write your best essay ever! Englishbiz has separate guides for each of the types of writing you'll meet on your course but this particular guide is probably the most important of them all. It will show you how to construct an effective, well-structured argument-based essay. How do you feel when you're given an essay to write? Do you fill with f-f-fear? W-w-wobble with worry? P-p-pour with perspiration? Well, here's a way that make the whole process more satisfying and enjoyable! Okay, he's off his rocker (but we won't worry as he's not real!). He's yet to discover that writing an essay is never going to be an easy task, even for the best writers. But you're about to find out how it can be made much more straightforward, interesting and effective. Oh, and likely to gain you a significantly higher grade, too! So that's something to feel, well... just a little bit excited about! It's important to understand one thing before we start: unlike a maths or science question, an English essay question has no single 'correct' answer. You can breathe easy on that one. It's just not like that. In an English essay there is no one 'answer' and nothing to 'prove'. That isn't to say there aren't wrong answers - there are. These are those based on 'mis-readings' of your texts. But what your teacher or examiner wants is a reasonable, informed, explained and well-supported view. In a nutshell, that's it. a succinct opening in which you give an overview of your response to the essay question. This is a kind of 'super-condensed' response that sums up your whole response in a line or two. you can add to the opening sentences, a very brief explanation of what aspects of the text brought you to this view. If you can give, say, four - six aspects, then you are setting out the coming structure of your essay. There is no better way to begin an essay than like this. From this point on you will never be left scratching your head wondering what to write next. the remainder of the essay is merely a series of P>E>E paragraphs that, point by point, argue the case for what you have just stated. Each point (P) needs its own paragraph and to have support (E) from the text (either a quotation, or an explanation of some aspect of form or structure) along with with an explanation (E) of how the text brought you to such a view, the effects it created, the methods the author used to create the effects and, finally, its relevance to the text, that is, the author's purposes. The secret of a good essay? Make it an argument! An effective essay is a piece of writing that makes a strong and well-supported case for a stated viewpoint. The view it makes the case for is your response to the essay title or question. You'll have arrived at after a couple of readings of the text, more if a poem, and one of which will be a so-called 'close-reading' when you annotate the text carefully in line with whatever the essay question asks, seeking out support as quotations or explanations of useful effects created by form and structure. The secret, as you might glean from this, is to put forward a view that has been condensed right down into a brief and succinct statement - an 'overview'. The body of the essay itself is where all the explanation, evidence and detail will lie; in the opening paragraph just try hard to condense your 'answer' down and down into a brief single statement that encapsulates your response. There are more examples of this later in the guide. The opening overview is sometimes called a thesis statement. The 'thesis' is your response, i.e. the heart of your 'argument'. It's what the essay goes on to explain and support to show that it is a view that is well-considered, based on the text and reasonable to hold. 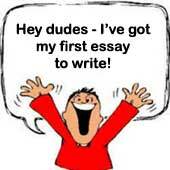 Writing an essay like this - starting with a thesis statement - will keep the essay focused, clear and coherent. You'll be far more likely to stay in line with the essay question and you won't lose marks through waffle, generalisation or re-telling. This point is crucial to take on board. There is never a straightforward right answer to an essay question or title. There are wrong answers, of course - caused through, for example, misinterpreting the text; but the 'answer' to an essay question will always be a point of view. Essays deal in opinions, not facts. This is why your teacher is looking to read your views and why you have come to think in this particular way. How do you arrive at a 'thesis' or overview? This is the tough part - there's no getting away from that. Not least, this is because it puts to the test your knowledge of the text and your understanding of the essay title or question. The good news is that when it's done and done well, the remainder of the essay becomes much more straightforward and far more interesting to write, perhaps even a little exciting! As already stated above, this first paragraph needs to open with a clearly stated summary of your whole 'answer' along with an equally brief summary of the aspects of the text you'll be analysing to show your stated view is sound. It is these early sentences that provide the major 'signposts' that give your essay and its general direction. Importantly, you need to set a confident tone early on in the essay. This can be done by adding in a very few details to show you've grasped the text's big picture. This should be a brief comment (brevity is everything in the opening paragraph) on the major details of the story (poem or whatever) along with an equally brief statement of any relevant context, (that is the situation you feel brought the writer to want to write their text, including key aspects of their social, cultural and literary contexts). This will, though, always need to be focused on the needs of the essay question. Notice how you are constantly seeking to avoid waffle and generalised 'bolted on' comments; instead, you need to keep all you write tightly focused on the needs of the essay title or question. This is the bulk of the essay. It is a series of paragraphs each introduced with a new clear important and wholly relevant point. Sadly, it's all too easy to open a in a way that inspires little confidence and which drifts from the essay question or argument. Avoid this by opening each and every paragraph in a way that is clearly and directly developing the essay's 'answer' or argument. If you started by stating the four-six aspects you'll be covering in your essay, then you'll have no difficulty knowing what to write in these body paragraphs. The point around which each paragraph is based needs to be one that builds up a good case for your opening thesis statement. Each point you make should do no more than develop your overall argument. Further, each and every point needs to be supported with evidence. This is usually in the form of a quotation from the text, accompanied by a clear explanation of how this evidence 'works' both as an effective use of language and as a contribution to some useful aspect of the text. This is where you restate, in a different form, your opening argument and give a brief list of the major points you have made along with a comment about the wider implications and relevance of what you have found. It will help to think back to the imaginary classroom situation. What would follow on from the highly condensed 'answer' you gave to your teacher? Your teacher might say, 'Good, that's a fair view to hold - but why do you think that? Show me from the text itself what made you think that way.' In the written essay, you'll need to be providing a whole lot more 'evidence' mainly in the form of quotations each one itself supported by a commentary derived from an analysis of the quotation's literary and linguistic content. However, with a central and guiding argument starting off and flowing through the entire essay, it now becomes much easier to search the text for aspects and quotations that will provide good quality evidence to support the essay's points. In general, you should aim to use one brief but apt quotation per paragraph. Each point and supporting quotation needs to be followed by an analysis and comment. Some teachers call this the P.E.E. (point > example > explanation) or P.Q.C. (point > quotation > comment) system. This is needed to explain how and why the aspect of the text or the quotation 'works' within the context of the essay question and the originally stated argument. What techniques have been used to make the language of the quotation effective? This means discussing the writer's methods, e.g. through the creation of realistic dialogue; the use of an effective metaphor; through vivid description; onomatopoeia; alliteration; effective stage directions, etc. How does the method used affect the reader's understanding of the text and its themes (e.g. 'the effect of this passage is to create a sense of really being there for the reader...')? MARK GRABBING TIP No. 1! Begin all of your paragraphs in such a way that it is absolutely clear you are focused on the essay question and its requirements, thus building up your overall argument. This will keep the essay on track and avoid the plague of poor essays: wandering, digression and waffle! What if your essay title isn't in the form of a question? If you think about it, all essays titles are a kind of question. They have to be because they are asking for your opinion about something. However, if your essay title doesn't easily lend itself to you seeing it as a type of question, your teacher will almost certainly be willing to alter it into one if you ask. For example, if you were given the title, 'Discuss Shakespeare's presentation of ambition in Macbeth', you could mentally consider this as, 'How and why does Shakespeare present the theme of ambition in Macbeth?'. If you think about it, you'll see that both of these essay titles are all-but identical and could lead to the same final essay. When considered as a question, you will often find it is easier to generate that all-important single main point of view to it - the main idea upon which you will then base the remainder of your essay. The remainder of this - or any other - essay must then be no more than a linked series of points with each point explained, developed and supported in a paragraph of its own. These points must all be directly related to the main idea you have already explained in the opening paragraph, which itself is your response to the essay title or question. Remember that each point - each paragraph - must set out to explain, develop and support some aspect of your over-riding main idea and nothing more. In this example, the paragraph that follows the opening paragraph - the first of what is called the body paragraphs of your essay - could be based on the point that the theme of ambition is shown through what Macbeth and Lady Macbeth are given by Shakespeare to say and do in Act One of the play. Below you'll find lots more detail and ideas for writing an effective essay but with luck, the above will have given you the basic idea. Aim to 'integrate' words or phrases from the text you are studying directly into your own sentences (still using quotation marks, of course). Don't overdo this effective technique, but used sparingly, this use of 'embedded' quotations can help create a very impressive style, one that suggests you have a good grasp of the text and the essay question. Perhaps Agard also wants his reader to 'come back tomorrow' with a different attitude towards those they might feel are in any way different from themselves. MORE TIPS AND MORE DETAIL! Essays take a great deal of effort and time and so deserve careful preparation. So... get to know your text well. You won't succeed if you don't! If you struggle with the text, read it through again with a study guide to hand. Also, talk the text over with friends or your teacher. There is more help with specific texts here. Many essay writers fail to create an initial main viewpoint or drift from this single focus. This loses marks as it leads to waffle, vagueness and generalisation. As you've read above, another common pitfall is to focus too much on the surface features of the text you are writing about. This happens when you write at length about the meaning of the text, i.e. by telling what happens in it. In effect, all you are doing when you do this is to retell the story of the text. Instead, you should focus on answering the essay question by interpreting the text's layers of meaning. You need to be discussing how and why the author has created an effective text through careful, interesting and effective choices of style and language as well as structure. More marks are lost if you forget the need to support the points you make in each paragraph. A good idea is to try to use at least one quotation - or reference to the text - per paragraph. Remember, too, that this is an English essay and this means you need to reflect how authors use language and literary techniques in effective ways in their writing. Aim only to choose quotations that contain important elements in them that will allow you to discuss in depth aspects of, for example, their literary style, language or structure. Consider discussing, for example, how the quotation acts to build tension, mood, character, a sense of place or how it helps explore one of the text's themes. Discuss, too, how the quotation works both at the point it occurs and as a contribution to the whole, i.e. the way it helps the writer achieve his or her purpose. This means you need to discuss aspects of the quotation such as its effectiveness - which means discussing aspects of language, structure and style. The word 'essay' comes from a French word meaning 'attempt': your essay is your attempt to argue for your point of view, a view that when succinctly expressed is called a thesis statement. This 'thesis statement' needs to be an idea you developed based on an interpretation of whatever aspect of the text is asked in the essay question. Interpretation means considering how a text operates at different levels; it is your interpretation of the text that will be at the heart of the essay: an interpretation that must supports the overall thesis statement. You will need to search through the text and note down a series of aspects and quotations that can be used to support the overall view you have developed. Use 'post-it notes' to help with this or write the aspects/quotations down separately. Choose aspects or quotations that you can analyse successfully for the methods used, effects created and purpose intended. Use your introductory paragraph to state your point of view, i.e. your thesis statement. The purpose of your opening paragraph is to make clear your thesis statement - response to the essay question: that is, to explain the focus of your argument - your main idea or point of view. Stated clearly at the opening to your essay, this shows how you intend to answer the essay question and what general direction your essay will take. Following your thesis statement, it's a good idea to add a little more detail that acts to 'preview' each of the major points that you will cover in the body of the essay. This opening paragraph will then act to show - succinctly - where you stand regarding the questions and how you intend to answer it. Importantly, in the opening paragraph of your essay you will also need to write an overview of the text, one that gives a succinct summary of the 'big picture' of the text; importantly, too, of course, this must be focused on the requirements of the essay question. Giving a succinct account of the big picture of the text in the opening paragraph will show that you have engaged with and digested the detail of three key aspects of the essay: the essay question, the text and its author - perhaps also, a brief account of the author's context. Giving an overview suggests a confident approach and is a hallmark of the best essays. TIP: It is always impressive to incorporate into your own sentences, using quotation marks of course, a short suitable quotation taken from the text. Some teachers call this using embedded quotations. Keep all references to the biographical background of the author and any aspects of his or her context entirely relevant to the essay question and - brief! Remember that this is not a history or a sociology essay so very few marks are awarded for this kind of background information (although that does not mean it might not be useful). The majority of marks in an English essay are awarded for the quality of analysis and interpretation you show - that is, an awareness of the author's uses of the English language and literary uses of this. If your essay title does concern aspects of context try hard to discuss context by deriving your comments from quotations rather than by merely discussing aspects of context; in other words allow the text to introduce the context. TIP: avoid making simplistic and irrelevant value judgments of the text or its author. Saying that Shakespeare is 'a wonderful author' or that you think 'Of Mice and Men' is 'really good' will gain no marks whatsoever - this is no more than a kind of waffle that fills space with empty words that add nothing useful to your essay. Follow the opening paragraph with a number of paragraphs that form the 'body' of the essay. Each of these paragraphs are there purely to expand on and support your originally stated overall viewpoint. Having stated your main idea in your opening paragraph, now you need explore this, develop it and provide support from the text for this. comment on how the language of each of these parts led you to form your interpretation: why did the author choose this particular type of language to make this point in this way? How does it help a) the audience and b) the writer's purpose or theme? Always aim to provide support for each of the points you make by referring directly to the text (this is the EXAMPLE part of P.E.E.). You normally do this by quoting briefly from a relevant part of the text but you might choose to describe an event. It's very important NOT to write a long description of WHAT happens. If you do you are merely 'retelling the story' - this loses many marks. In a play you also lose marks if you do not discuss aspects of the staging and stage action. You will need to follow each quotation with an explanation of and a discussion on aspects of the language the author used in the quotation; this means discussing, for example, how aspects of the quotations literary, poetic or dramatic language works, including mentioning the method the writer used, the effect the language creates and the reasons this might have been done (this is the EXPLAIN part of P.E.E). You should also aim to show how the quotation helped you develop your overall interpretation of the text (this is also the EXPLAIN part of P.E.E). Always work in a clear way through the text, from beginning to end. Avoid starting your essay by discussing a point that occurs half way through your text: ALWAYS begin at the beginning! Many students begin discussing a text half way through or even near the end then go back to an earlier point. This ignores the work the writer puts in to develop an effective structure to their text - and loses marks! 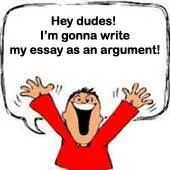 The conclusion to an essay is important but causes problems for many students. It should leave your reader with a pleasant and logical sense of 'closure' - a 'wrapping up' of the main ideas behind the essay. 1. Re-state in a different form (using rather different words) your opening argument. 2. Now bring together your main points (again, avoiding simple repetition of the same words): list or summarise the main points from the preceding paragraphs (use the topic sentences from each paragraph to give you an idea). 3. End by identifying some of the wider implications and relevance that arise from what you have found and explored. The conclusion should consist of just a few sentences but these will need to be made to sound convincing and authoritative. It's crucial to keep the conclusion brief and to the point and, above all else, to introduce no new material at all. Which approach and style would gain the higher mark? STUCK FOR WHAT TO WRITE ABOUT? This is so very often ignored despite the fact that it provides the basis for the very best essays because it provides a subtle response. And subtlety always receives the highest marks! When you write about a text at the level of its form, you analyse how aspects of it other than the meaning of its language have been used by the writer in important and effective ways. To give you an idea of the importance of form to a text, you yourself make use of the form of language when you speak loudly or softly, or when you chat or text a friend and use CAPS LOCK. Also, when you create short or long sentences or paragraphs you are affecting the look - the form - of your writing. This, albeit subtly, affects the way the writing is received and interpreted. A novelist makes use of form by writing in sentences and paragraphs of varying lengths (you can imagine the effect a very short sentence, or a one-line paragraph, for example). The use of dialogue (spoken words shown inside speech marks) is also an effective use of form, as is the use of underlining, bold or italics - or, in non-fiction texts, the inclusion of bullet points or sections. Poets are acutely aware of and very creative with the use of form. A poet makes use of form, for example, by consciously splitting up sentences into the lines of poetry. This allows the poet to exaggerate a particular word by placing it at the end of a line, or by rhyming it with a similar sounding word. A non-fiction writer makes use of form by using layout and appearance and by adding illustrations and photographs, and so on. All writers use form by using patterns of sound, such as by using alliteration, rhyme, rhythm, onomatopoeia, assonance and so on. A playwright, of course, uses form very differently. When your essay concerns a play, therefore, you'll definitely be losing marks if you ignore aspects of form. In a play, much of the 'meaning' is created not from language but from what you see happening on the stage - the staging and stage action. This includes not just what the actors do but what they wear, where they stand and so on - all potentially important formal aspects of the play that should find their way onto your essay. Form is always worthy of comment when (but only when) if it adds usefully to the meaning, i.e. the content of a text. Every word and phrase has a literal meaning. This is its basic dictionary meaning. It's sometimes called a word's denotation. E.g. 'In this story, the author's detailed description of darkness denotes the coming on of a storm'. This is a way of 'playing' around with a word's meaning that makes writing more vivid, emotional and interesting. Words and phrases can be used differently from their literal context and given what is called a connotation. Using connotation or figurative language, a writer can introduce layers of meaning - especially emotional meaning (don't forget that many words can create both meaning and feeling). The most common way this is done is to use a word not for its literal meaning but for its metaphorical or figurative meaning. Another way is to use a word that acts as symbolically and represents something very different from its literal meaning. E.g. 'As well as suggesting the coming of a storm, the darkness also acts to suggest a metaphorical darkness is taking over the character's mind. In this way the darkness seems to be symbolising a kind of evil'. Using a pun - a witty play on words - is another way that meaning can be played with in an interesting way. Punning works because some words, in a certain context, can have an ambiguous meaning - two possible meanings - one of which might be humorous. Irony is a key way that writers use to create layers of meaning. Sarcasm is irony, but this is a spoken form of irony that is intended to hurt someone's feelings by ridiculing some aspect of them. It's a crude, easy kind of irony not really subtle enough for writing. Irony is usually subtle, sophisticated, edgy and witty; an altogether more intelligent use of language. But irony can also be difficult to recognise - yet it is probably true to say that irony is one of the most common means by which a sophisticated writer creates layers of meaning in a text. Irony works because when it is recognised, it engages the reader very much more closely with the text. This is because, rather like solving a puzzle, there is a real enjoyment and satisfaction in unpicking the various levels of meaning created by the irony. Creating an 'ironic tone of voice' in writing is much harder than in speech because the original sound of voice and facial expression or body language of the speaker are absent. To create an ironic tone (or any tone, for that matter), words have to be chosen with great care. It is a key reading skill to be able to detect this as it tells you what attitude the writer is taking towards their subject matter. An example of irony occurs in an old story by O. Henry called 'The Gift of the Magi'. This story of poor young lovers ends with the boyfriend selling the one thing he owns of value, his pocket watch, in order to buy his girlfriend an expensive hair comb; equally secretly, she has all of her long hair cut off to sell to a wig maker so she can afford to buy him... a chain for his watch. The content of a text is never available immediately (except in a single word, maybe: STOP!). Meaning needs to be built up throughout a text in ways that are often important to the overall effect on the listener or reader. This is the structure of the text. Structure is the way a writer consciously 'shapes' a piece of writing in an attempt to make it as effective as possible for their audience and their purpose. It is important to comment on the structure of a text, e.g. 'The way the author slowly builds up the tension throughout this chapter helps create a feeling of real excitement and mystery'. Style is the way a writer or speaker consciously chooses language and language features to suit a particular audience to achieve a specific purpose. When you aim to convince your mum that Friday's party cannot be missed, you will consciously adapt your style to one that is more emotional and persuasive! Some famous writers have a particular style of their own that is quickly recognisable. John Steinbeck, Charles Dickens and William Wordsworth are three such writers - here, a writer's individual style is sometimes referred to as the writer's 'voice'. Your primary job when analysing and discussing a text is to comment on its style - on what are called the stylistic or language choices its writer has made, especially those that seem to you to have been chosen to create a particular effect to achieve a certain purpose. So... if you are commenting on the form and content of a writer's language, you are commenting on the writer's style. Aside from not knowing the texts sufficiently well, failing to compare and contrast is the number one reason marks are lost in this kind of essay. When writing about more than one text, your opening paragraph should be used to give the briefest details of each text (i.e. your writing needs to be succinct!). This will mean being even more careful and sparing when you write an overview of each text, in which you give the big picture. It's vital to keep everything relevant and tightly focused on the requirements of the essay question and your argument. 1) Write about the first text fully before moving on to the second - still using the techniques outlined above; but when you go on to write about the second text, you must compare and contrast it with the first. 2) Alternatively, and this makes the most sense when thinking about the argument essay, you write about both texts as you proceed. This allows you still, as shown above, to create a central argument, one in which examples to support the points are taken from one or both texts as relevant to the point. This second method is the more complex and sophisticated of the two. You will still need to open each paragraph with a point that helps answer the essay question, i.e. a point that supports your overall view stated in the opening paragraph.